Use your BlackBerry PlayBook for work and for play--this book shows you how For all you business road warriors who don't go anywhere without your BlackBerrys, the road just got a little more comfortable. The BlackBerry PlayBook is a tablet is your go-to-gadget for working on the go. Use your BlackBerry PlayBook for work and for play--this book shows you how For all you business road warriors who don't go anywhere without your BlackBerrys, the road just got a little more comfortable. The BlackBerry PlayBook is a tablet is your go-to-gadget for working on the go. Learn how to take full advantage of this powerful newcomer to the tablet market with this full-color For Dummies guide. You'll discover how to use your PlayBook to connect to corporate systems, manage your finances, keep track of your travel and other schedules--even how to use the PlayBook as an e-reader or portable entertainment center. Take full advantage of its web browser, media players, two cameras, third-party apps, and more, with this practical, four-color guide. Helps you get up to speed on the BlackBerry PlayBook device Translates techno-babble into clear and simple language, explaining how to use your BlackBerry PlayBook to access the Internet, your own office's intranets, and more Explains techniques, features, and technology to newcomers who are new to tablet devices, as well as to seasoned users who seek information about the new QNX operating system, software options, and new appsCovers how to set up the PlayBook and customize it for your personal needs Explores how to locate and download apps and programs, manage finances, oversee travel and other schedules, use your new PlayBook as an e-reader, multimedia device, and more Baffled by your BlackBerry PlayBook? 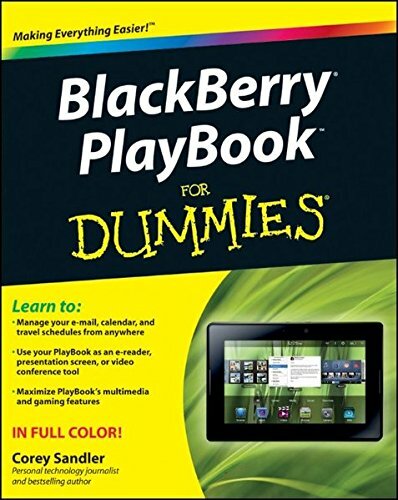 Become a PlayBook power user in no time with BlackBerry PlayBook For Dummies .